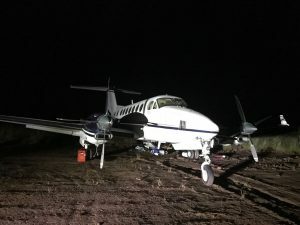 The illegal aircraft that was found on an illegal airstrip in North Rupununi. A contractor in Lethem was Monday arrested and a backhoe seized, as Guyanese police intensify their probe into the unauthorised landing of a Brazilian-registered plane on a recently graded illegal airstrip, sources said. Sources said the contractor was arrested Monday and his vehicle taken to the Lethem Police Station. He was among three contractors who were detained for questioning last weekend about the levelling of the 5,000-foot long area where the plane landed one week ago. Head of the Criminal Investigations Department, Senior Superintendent Wendell Blanhum earlier Monday said investigators from Georgetown were due to travel to Lethem on Tuesday. Blanhum also said particulars from an identification card and a passport have been passed on to the International Police Organization (InterPol) as part of a request for foreign assistance. The plane, whose registered owner is the Brazilian bank, Banco Bradesco as a result of a financial transaction, is operated by Sinalizacao Ltda ME. That company in April purchased the plane from Riwa SA for US$850,000. Police said three men were seen running away from the plane whose authentic registration markings are PR-IMG. President David Granger earlier Monday expressed surprise that no one in Region Nine knows anything about illegal aircraft operating in the area. A Regional Intelligence Committee has since been activated. Soldiers last year September stumbled on a Cessna plane under a forest canopy at Yupukari, Region Nine. The plane, which had fake United States registration markings, later turned out to be Colombian registered.